The workers of the Zuevsky Works of Energy-Mechanical Engineering (who have been unemployed for a long time) appealed to the chairman of the Supreme council of Donetsk Peoples’ Republic. The workers propose as a solution to the problem – to introduce collective form of property in the enterprise. 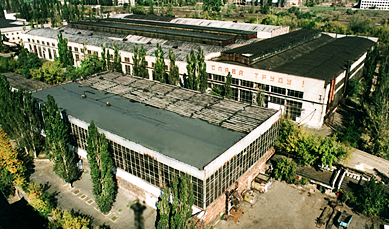 “Zuevsky Works of Energy-Mechanical Engineering is the main enterprise in the city and is part of the DPR’s strategic enterprises. That’s why the issue of organizing the conference of the labor collective as the highest body for self-governing – is put under consideration. The agenda was developed jointly by the workers of the plant and the authorities of the town of Zugres” – said the deputy of the DPR Supreme Council Alexander Smekalin, who also participated in the process of developing the agenda. According to him, the agenda should contain the issues of re-organisation of the property rights, organizing the council of the labour collective, financial report for 2013-2014, and the plans for renewal of the work and developing the enterprise in 2014-2015. “The workers warmly remember the former head of the enterprise Stepan Portnov – that’s why we asked him to become the interim head of the enterprise” – summed the deputy A. Smekalin. This entry was posted in News and tagged dnr, Donetsk, dpr, zemz, zugres. Bookmark the permalink. It appears that the workers at ZEMZ have gone ahead and established collective ownership of the factory. If this turns out to be true, it’ll be an important development indeed.